Starry Night Nativity is a traditional narrative, told in a new way. Nativity figures are carved in bas-relief within an 8" box that opens as a triptych to reveal a starry night encircling an intimate scene. Lord's use of deep gradated blues, sparkly gold and symbolic imagery is a reference to historical objects of art. "I embellished the surface with gold dots-symbolizing light, energy, hope, inner strength. Gold connotes preciousness and enduring value, and I wanted this to be a special piece, that would be kept for a long time." 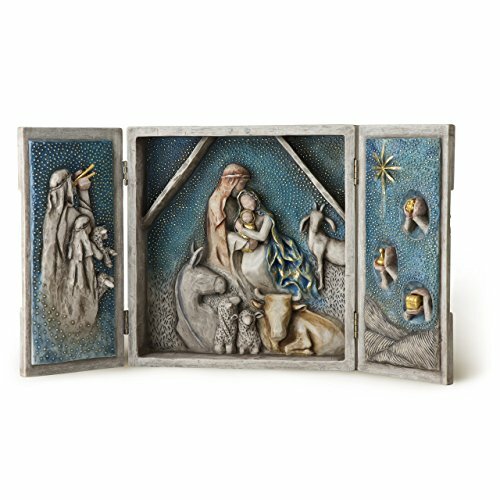 -Susan Lordi Starry Night Nativity can be displayed year round, with as much visual interest when doors are closed as when opened. The piece can be hung on a wall, or sit on a mantel or table. Hinged doors open flat or at an angle. Starry Night Nativity is packaged in a custom-designed, protective Signature Collection Gift Box.